Spent Grain Chocolate Chip Cookies Ready to Eat! 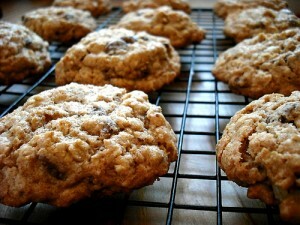 Spent Grain Chocolate Chip Cookies Secret Revealed! 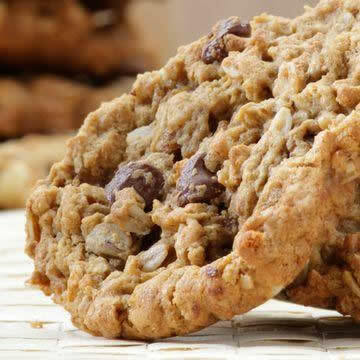 The “secret” ingredient in Craft Beer Chocolate Chip Cookies is spent grain, of course. So, what happens to the grains that brewers use to make the great craft beers served in their brew pub, or to those used by a home brewer? All of the rich malted barleys or specialty grains that are so carefully mashed in order to remove the soluble malted sugars are sent to a rest home after they have done their job. After cooking at between about 148° F to 154° F they are surely tired – or spent? Many breweries will give or sell them to farmers for compost or supplemental animal feed. Home brewers may just throw them in the trash. But, they have lots of uses, one of which is for baking. A local brewpub or home brewer may give you a few cups just for the asking. Only a few cups are needed for most recipes, and any extra spent grain that you have can be divided by the cupful, frozen, and used for another batch of goodies. Oh, make sure and put some of the cookies aside for yourself – if you like. I won’t mind. Let’s get baking! Mix with a mixer, peanut (or almond) butter, butter, sugar, milk and vanilla. Add flour, spent grains, baking soda, salt, and mix well, but not too much. If worked too much, the gluten is over-developed and the cookies are more likely to be tough. Stir in the chips by hand until evenly distributed. Bake on a lightly greased cookie sheet at 425° F for 8-10 minutes. Let the tops get slightly brown, but don’t let the bottoms burn. Remove from oven and cool on the pan for about five minutes. Carefully transfer to cool on a wire rack, or they may cool on the pan. Now The Hard Part – Enjoy! Makes about 2 to 2-1/2 dozen chocolate chip cookies, depending on how large you make them. Note: Depending on the grains used in making the beer, there will be variations between the batches of grains that are gathered from your sources. This may alter the flavor, color and/or texture. 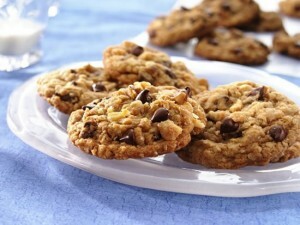 Enjoy your Spent Grain Chocolate Chip Cookies and get a free e-Zine too!There are many entertaining and informative articles that you can receive free with your subscription of Black Bucket Brew e-Zine. Subscribe Now for your free emailed copy! Agreed and thanks! Great cookies. I’ve had them with spent grain from my smoked porter recipe. Wow-how cool! Glad you like them! My boyfriend brewed an amber this afternoon and I made these. He ate three right out of the oven and then immediately requested I make a second batch to take to his work (he works at a brewery) so he can have the first batch all to himself. Great! Glad that he liked them! Thanks for the “feedback”. Pingback: Cheers! » No matter what's in your glass7 Ways Homebrewers Can Use Spent Grains » Cheers! Very nice recipe! I used dried cranberries instead of chocolate chips (didn’t have any handy…) and they turned out great! My husband was impressed/a little miffed I was able to get a batch of cookies out before the wort was even chilled 🙂 thank you for sharing the recipe! Hey Megan! Glad that it was a hit with cranberries. That sounds like a great combo. Thanks for the feedback! Hi! I made my first batch of these with spent grains from a local brewery. They turned green overnight on the counter! Thoughts?? I can’t figure out why they turned green! I just made this recipe with some minor mods for altitude (decreased sugar and B.S. by about 10% and temp to 420*) as I am at 7000 ft and they came out fantastic. Used 1/2 white flour, wheat flour and and of course more chocolate. Bigger cookies looked better since spent grains laid more flat than smaller ones where they stuck up and cooked more than elsewhere.